A company will periodically need to make decisions on the purchase of machineries and equipments for the production of the goods and services that it sells. When making some of these decisions, leasing is always an important factor to consider. To the company, it is the use of these machineries or equipments that are important, not the ownership. Thus cost is the main consideration whether to purchase or to lease the machineries and equipments. A lease is an agreement made between the owner (lessor) and the user (lessee) of an asset. The agreement allows the lessee the right to use the equipment by making periodic payments to the lessor. The lessee will typically only consider leasing if the total amount of the lease is less than the amount required to purchase the asset. The question to ask is of course, how will the lessor be able to gain from such a lease? The answer lies is in the amount of tax reduction call a tax shield that a company will be able to claim. A tax shield is defined as the reduction in income taxes when a company claims an allowable deduction from taxable income. An example of an allowable deduction is the interest that a company pays on the debt it has taken. The interest can be used to reduce the taxable income. Another example of a tax shield is depreciation. If a lessor is able to use depreciation and interest tax shields that cannot be used by a lessse, then the lessor will be able to offer a low lease payment that reflects the tax shields while still making a profit. Net advantage to leasing is defined as the net present value of entering into a lease instead of borrowing money to buy the asset. If the net advantage to leasing is a positive value, it suggests that a company should enter into a lease instead of buying. 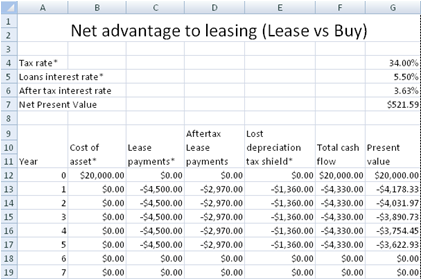 This spreadsheet helps companies make the decision whether to buy or lease an asset through the calculation of Net Advantage to Leasing. Tax rate - The company tax rate. Loans interest rate - The interest rate for taking a loan to purchase the asset. Cost of asset - The amount required to purchase the asset. Lease payments - Lease payments before tax. As lease payments are tax deductible, the lease payments after tax will be calculated by the spreadsheet automatically. Lost depreciation tax shield - If a company choose to purchase an asset, the depreciation is tax deductible. Choosing to lease an asset will result in the lost of depreciation tax shield. This column allows you to enter the lost in depreciation tax shield. If the Net Present Value is a positive number, it is more beneficial to lease than to buy the asset.